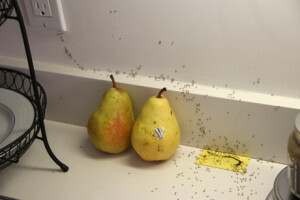 Ants are a common household nuisance, both indoors and outdoors. Contrary to what some people think, ants are often difficult to eliminate and using a household ant killer is not enough. In order to get rid of an ant colony, you must first find the nest and eliminate the queen. The easiest way to do that is to follow the trail. Ants stay pretty true to course coming and going. Killing an ant trail, while effectively killing the visible ants, will only cause the colony to relocate and create another trail. Ants can nest in a multitude of places, including soil and producing mounds, in homes behind baseboards, counter-tops and moldings and also in damaged or water logged wood. Typically ants do not cause too much damage, although carpenter ants can cause structural damage over time and anyone familiar with fire ants knows they will bite. Speaking of fire ants, how do you know if you have fire ants? Fire ants tend to be smaller than most people think, reddish-brown in color and will display aggressive behavior. Disturbing a fire ant mound will result in a swarm of ants coming out of the mound. Their tunnels can be as far as ten feet underground in certain soil types. You will see them after a rain “working” on their mounds. If you notice an ant trails in or around your home similar to the one pictured below, please call Advanced before treating it yourself!